I finally got around to processing, editing, and posting two short video clips from my trip to North Korea (Journey into Kimland). The first is from a CD* of the North's Arirang Festival, the other is from a performance by a talented group of children at the Schoolchildren's Palace in Pyongyang. One of the most amazing spectacles I have ever seen (click here to read the Arirang Festival account) and hardly done justice by a mere video clip. 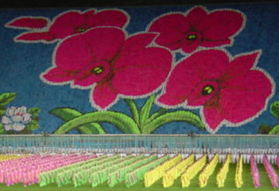 When watching pay particular attention to the scenes shown on the far side of the stadium - they are not from a movie or special effects, as the NK narrator explains, they are all done by thousands of people simultaneously flipping a series of colored cards. 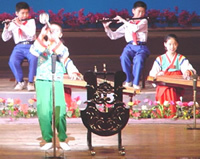 The highlight of Pyongyang's Schoolchildren's Palace tour (click here to read the account) was a musical performance by the students. How kids that young can be so talented and perform so well is beyond me. Their timing and professionalism would do honor to anyone, and, as you watch the clip, you'll soon realize who the honor goes to in North Korea . 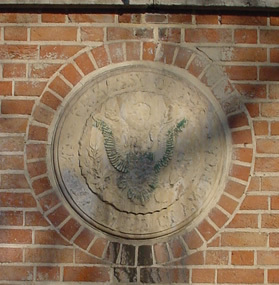 . .
Getting the photo to the left almost got me arrested by the police outside the former embassy - it's illegal to take photos of the facility here, probably due to the Basiji militia inside. After the police drove away, and with camera firmly in my pocket, I took out my old video cellphone. The anti-American and pro-Khomeini paintings along the outside of one section of the wall were just too photogenic to pass up. Pretending to talk on the phone, I surreptitiously took a quick video of the row of paintings. Keep in mind this is a clip from a cellphone taken while I scanned the area for police, militia and soldiers - high quality it ain't. *The first two video clips above are partially from CDs purchased in North Korea. If anyone from North Korea responsible for them is reading this and has a comment please contact me. Thank you.